Home»Blogs»Matthew Knight's blog»Why does ISON look green? You may have noticed that Comet ISON appears to have a green halo in some recent images (like that opposite), but in other images acquired at about the same time, it doesn’t. Thanks to the beautiful new spectrum posted earlier today by Christian Buil, it’s relatively easy to understand why. The light we see from a comet is a combination of sunlight reflected off of dust grains (often called “continuum” by astronomers) and light emitted by molecules when they are hit by UV sunlight (“emission”). The emission that is visible to the human eye and to most optical telescopes is in the “visible” part of the electromagnetic spectrum, from roughly 3800 to 7600 Å. The most prominent emission by comets in this region occurs due to the emission of CN (cyanogen), C2 (two carbon atoms), and C3 (three carbon atoms), as illustrated nicely in Christian Buil’s spectrum. Please click to see it, it’s really an impressive image! As you can see in the profile (the plot at the bottom that says relative intensity), there are big peaks in the spectrum around 4700 Å and 5100 Å. These are due to C2. You may remember from high school science classes that the human eye is most sensitive in the green region of the spectrum, roughly between 5000 and 6000 Å (sorry the units are changing between plots; 10 Å = 1 nm, so 5000 Å = 500 nm). 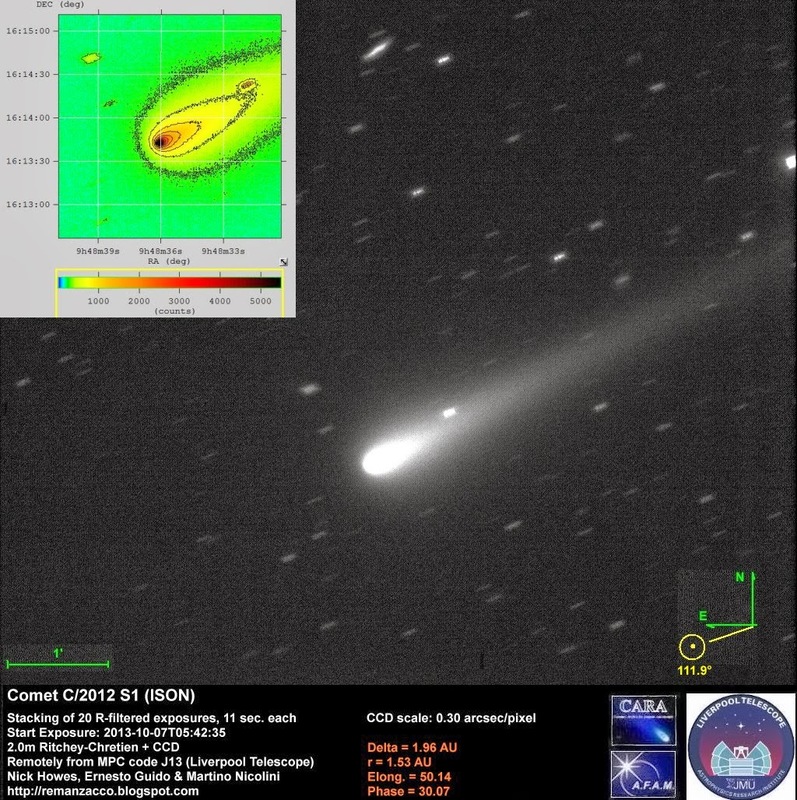 Since this is also where the C2 emission is strongest, your eye really notices a lot of green and, voila, a green comet! If you just want to know why comets often look green, you can stop reading now. It'll get a bit more technical from here on out.. In astronomy, most CCD cameras use filters that only let certain wavelengths of light through. Adam Block created his spectacular image where the comet looks green by combining images taken in three filters roughly corresponding to red (R), green (G), and blue (B). These combine to make a color picture similar to what your eye sees. Returning again to Christian Buil’s spectrum, there is almost no emission in the red region (roughly 6000 to 7000 Å), there is a lot of emission in the green region (roughly 5000 to 6000 Å), and there is some emission in the blue region (roughly 4000 to 5000 Å). Thus, when these are combined the green color dominates and you see a green comet1. 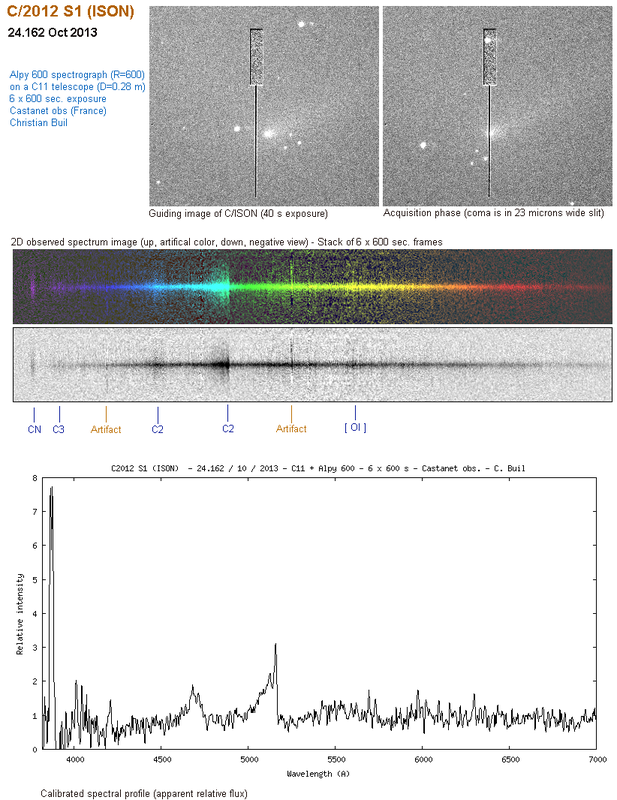 Many images of comet ISON are taken with the R (red) filter. As I just noted, this region is relatively free of emission, so most of the light from the comet is due to dust reflecting sunlight. Thus, an R image (like the image by Nick Howes et al.) primarily shows the comet’s dust. One really nice application of this is that by careful consideration of where to make filters transparent, astronomers can isolate either dust or gas emission, and therefore can study particular features of the comet. My primary work utilizes this principle, and we have “comet narrowband filters” [PDF] specially designed to look at CN, C2, C3, dust, and a few other things. My preferred gas to study in comets is CN. As you may have noticed in the spectrum above, there is a really tall and narrow peak near 3900 Å that corresponds to CN. CN emission Is really bright, however, we don’t normally “see” comets looking blue for several reasons: our eyes aren’t very sensitive to that short of a wavelength, the atmosphere absorbs light more efficiently at short wavelengths, and many CCD cameras are not designed to be sensitive there. If you have a telescope and CCD setup that can actually observe it, CN is a very good way to look for gas activity in comets! 1Note that along the dust tail there is far more signal coming from reflected sunlight off the dust than from emission. In these areas the three colors combine to produce something that looks roughly white because you are seeing roughly equal amounts of red, green, and blue. Also note that light combines differently than does paint. Combining equal amounts of red, green, and blue light gives you white; combining red, green, and blue paint gives you brown.